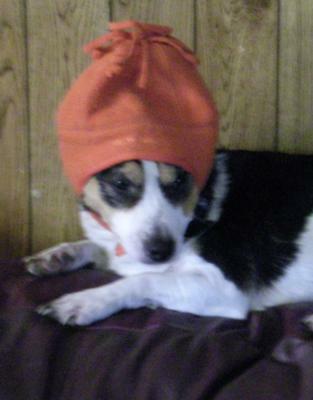 This is my Jack Russell Terrier. He is a very good dog. He is very caring and very protective of me and my family. This is a picture of him and his hat that he loves to wear. He won't go outside in the winter unless he has it on. My family got him from this little amish family.We got him and some others but hes the only one we got that is a Jack Russell. We recently had a puppy that we got from one of the litters had. But just recently we lost her because she was sick, her name was Miley. He was very protective of her and only her. We miss her very much. We gave him his name because og the little boy off off Willy Wonka and the chocolate factory. We were going to name him Shep, but he won't answer us my mom thought that he was deaf and we were going to take him back, But we thought about the name Bubba and he answered us so it stuck. We had him for a few years now. He is very Loved in my family and had we lost him he would be very missed.He also loves the song "how much is that doggie in the window" but we switch the lyrics to "how much is that Bubba in the window". That is my story about my Jack Russell Terrier Bubba. I just fell in love with Bubba and his lovely hat. How could anyone live without a JRT/mix?